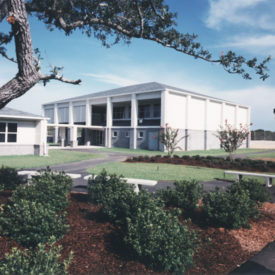 In late 1999, Pensacola State College commissioned Bullock Tice Associates to master plan their 100 +/- acre site located in South Santa Rosa County. The primary purpose of the master plan was to provide an orderly, environmentally responsible plan for growing the College’s presence in this fast growing area of its service region. The site is highly impacted with wetlands (consuming over 40% of the site), requiring careful placement of roadways, parking, building locations and outdoor activity areas. The plan consists of three building phases with associated parking and stormwater management. Plan Region I consisted of 96,000 SF of building area; Region II, 72,000 SF; Region III, 9,000 SF; and Region IV, 46,000 SF for a total of 217,000 SF with a total parking capacity of 2,037 spaces. 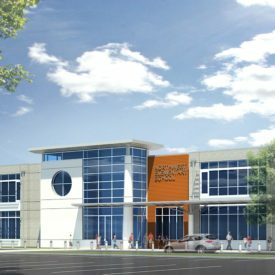 BTA recently completed Architectural and Interior Design services for the initial phase of this project which includes a 32,000 SF, two-story, multi-use facility. 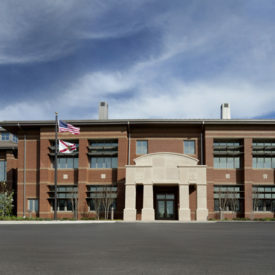 The Center includes a conference room, classrooms, science labs, a computer lab, an administrative area, financial aid offices, faculty offices, a student services office, a library and a bookstore. Phase I also includes parking for approximately 285 vehicles. Pensacola State College President Dr. Meadows’s vision is to create a Center that will emphasize green technology and green jobs. 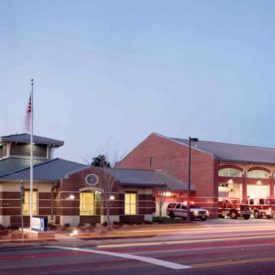 As a result, the new achieved LEED “Gold” certification. Sustainable elements include high efficiency mechanical systems, captured daylighting and wetlands preservation to enhance the natural surroundings.